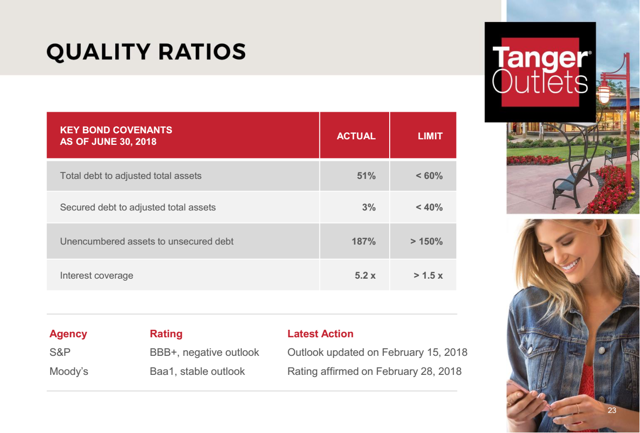 Tanger Factory Outlet Centers (SKT) is a solid REIT with a great dividend track record. Management has been prudent in protecting their balance sheet and keeping leverage low. They are very firmly within the investment grade credit rating and have significant excess cash flow even after paying the common dividend. The bears on SKT must be ignoring a few simple fundamental factors. If SKT’s net operating income is simply flat over the next several years, SKT would still be a very reasonable investment. If net operating income was flat, we would expect very minimal pressure on total FFO as interest rates increase and a portion of the debt is refinanced. The impact to total FFO should be quite small. Since SKT has so much excess cash flow after all of their operating expenses, common dividends, and capitalized expenditures for the properties, they are free to repurchase shares. By our estimate, they could reasonably shrink the number of shares outstanding by around 2% per year. That means even with flat FFO or an extremely minor decline in total FFO, the FFO per share would still be increasing. This also assumes SKT would continue to raise their dividend and maintain a similar payout ratio on FFO per share. We see the above as the bear case scenario. It is more likely that we will see same-store NOI growth in 2019. Pressure on NOI in 2018 was tied to the Toys “R” Us bankruptcy. SKT knew the bankruptcy was coming but expected more of the impact to occur in 2019 rather than 2018. Because the Toys “R” Us bankruptcy hit earlier than expected, the weakness in earnings shows up for 2018 instead of 2019. With an expectation for moderate growth in same-store NOI on average over the next several years, we would expect total FFO to grow modestly. Given the expectation for a declining share count, we would expect FFO per share to grow a little faster. 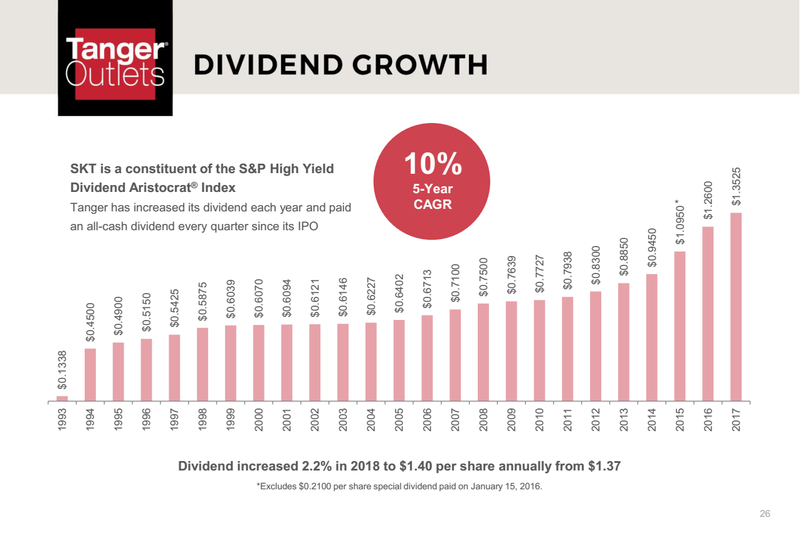 If FFO per share and dividend per share grew at 1%, we would expect long-term returns to the buy-and-hold investor to run around 7% with 6% from yield and 1% from growth. In a more bullish scenario, we would be looking at FFO per share and dividend growth running in the 3% to 4% range which combines with the 6% yield for 9% to 10% in total returns. It is important to point out that this is forecasting the return from the dividend and the growth rate rather than speculating on the price movement over the next month. Some short-term investors will be focused on the change in share price. We view the most likely direction as up over the next 12 months. However, predicting precisely where the share price will end is not a reliable indicator of long-term results. We’ve seen a few buyouts on REITs so far in 2018, including one in the mall space. While these are outlets, it is still classified as a mall REIT (sometimes a strip center). There is an enormous amount of private capital looking for entry into real estate. This private capital is driving valuations on real estate. Ironically, the funds managing it are benefiting from the lack of transparency in their structure. Investors want real estate, but they are terrified by the day to day price movements in the stock. The price movement in the underlying asset, the real estate, is dramatically smaller. Consequently, investors are occasionally more comfortable with simply getting an appraised value a few times per year rather than seeing the daily fluctuations in market price. It seems absurd that investors would pay a premium for less liquidity and less transparency, but that is precisely what is happening in the real estate market today with an enormous amount of wealth. A prudent manager in this structure might look to buy a REIT this way and then report the net value of the assets to investors. For instance, Blackstone (BX) recently acquired another REIT for their portfolio of real estate. Prologis (PLD) acquired another REIT. Buyers exist with the capital to swallow entire REITs. General Growth Properties (GGP) was recently swallowed by Brookfield Property Partners (BPY). It would be sad to see SKT go right after hitting 25 years of dividend growth, but management indicates that they are willing to pick up for the phone for anyone who wants to make an offer. Generally, that would be on one property or a few properties, but a bid could be made for the entire company. In terms of our balance sheet and capital position, we’re in great shape. We have a largely unencumbered portfolio, maintained solid interest coverage and have no significant debt maturities until 2021. We are committed to sustaining a stable and flexible financial position. We plan to continue to deliver a very strong level of cash flow and remain disciplined in our capital allocation decisions with a singular focus on creating value. The cash we generate covers our capital needs for investing in our assets, paying our dividends, repurchasing our common shares and deleveraging our balance sheet. Our dividend, which remains a priority, is secure and well covered. We have also continued to execute on our share repurchase program. Going forward, we do not anticipate any new developments in 2018 and ’19. But we’ll continue to evaluate our priority uses of cash and long-term opportunities for growth. While we recognize the challenges we have discussed related to select overleveraged retailers, we believe industry sentiment surrounding fashion retailers is improving. According to recent reports, nearly 7,000 stores closed in all retail properties were announced in 2017. And slightly less than half of that number is slated to close this year. Importantly, offsetting those closures, approximately 2800 stores are scheduled to open this year. This all suggests a healthier retail outlet. Our confidence in the long-term growth of the outlet distribution channel remains unwavered. In particular, relative to other retail channels, we don’t believe that outlets have been overbuilt. So the need to right-size and the competition among landlords is minimized. Furthermore, we are increasingly hearing the conviction among retailers that brick-and-mortar is a critical element of their omni-channel brand strategy. While the positive sales are encouraging and our conversations with tenants and prospects are constructive, we know there’s still much work to be done. We continue to employ a strategic approach that has proven effective and successful over the last 37 years, which includes keeping the tenant mix of our centers dynamic and giving Tanger shoppers the brands and designers they want. With this long-term view, we have proven we can successfully adapt to evolving consumer preferences and align those with tenant needs. We believe SKT is still attractively valued and expect it to perform well on the basis of higher expected FFO per share next year and continued dividend growth. The payout ratio is excellent and there is plenty of FFO leftover after paying the dividends. The balance sheet and debt maturities are great. SKT has raised its dividend for 25 consecutive years and is currently trading at a large discount to the net value of their assets. We believe the net value is around $30.00 per share. If you enjoyed reading this article and want to receive updates on our latest research, click “Follow” next to my name at the top of this article. The REIT Forum is the #1 rated service on Seeking Alpha. We focus primarily on defensive investments with high growth potential. With our strategy, we have returned 22% every year since the inception of our service. It is our objective to find quality investments at a discount, along with trading opportunities for the more active investors. Most of our research is on companies that are excellent investments over the long term. Disclosure: I am/we are long SKT, BPY.